More than 600 workers walked out of Amazon’s buildings in Bad Hersfeld and Rheinberg, Germany, on Black Friday, Nov. 23. The Verdi service workers’ union represents the Amazon workers, who are asking for higher wages and better working conditions. Amazon has a reputation for pressuring workers horribly, especially during the peak retailing season starting now. 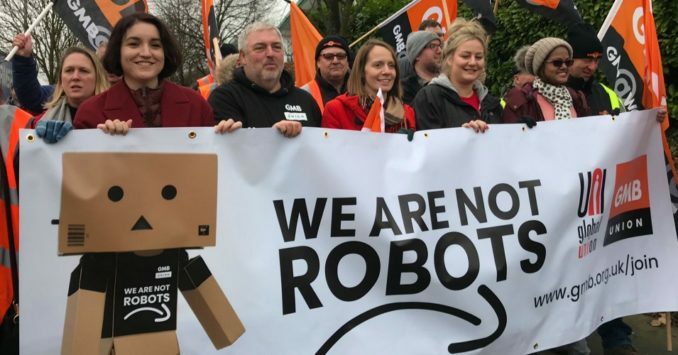 In Spain, according to UNI Global Union, workers at Amazon’s Madrid-area San Fernando de Henares facility, where 1,800 workers are employed, also stopped work that day. They were last on strike during Amazon Prime Day, July 16-17. That day is another major shopping day at Amazon. Amazon CEO Jeff Bezos was recently named the richest person in the world. This ego boost gives him bragging rights among other top exploiters of the world’s workers, like Bill Gates, Warren Buffet and Mark Zuckerberg. It also eliminates any chance he can plead poverty if the more than half million people who work for Amazon decide to fight for higher wages. That’s just what happened on Nov. 23. There are more worker actions in Europe than in the U.S. because more workers are unionized there. None of Amazon’s U.S. warehouse workers are represented by unions. That doesn’t mean there is no U.S. organizing. A group of Somali Muslim women workers at Amazon’s Shakopee, Minn., warehouse are planning a job action in December over workplace conditions and religious accommodations. The workers have held meetings with Amazon management protesting speedups and the inability to take breaks from work in order to pray. The women in Minnesota are the first group in the U.S. that has made some headway organizing against the powerful company. They voted to stage a large protest and walkout on Dec. 14, in the thick of the holiday season, according to the Nov. 20 New York Times. The giant company has 110 warehouses across the U.S. The one in Shakopee needed 1,000 workers when it opened in 2016. Workers at Whole Foods, which is owned by Amazon, have also recently begun talks of organizing.